Growing up, Easter was a time of pretty dresses, Easter egg hunts and the hint of spring. It was my grandmother who picked out a pretty dress for me to wear on Easter morning. It was my mother who curled my hair and offered a chocolate bunny and other treats. Once I had my own children, I looked forward to picking out a nice dress and suits, but also as a follower of Jesus I wanted my children to focus on the real meaning of the holiday. From the time they were young instead of picking out an Easter basket filled with all the treats, my husband John and I purchased a Christian book, video or music CD for each of them—something they could continue to enjoy throughout the the year. Something that would remind them of Jesus’s love. This Easter our new baby girl is just one-years-old. 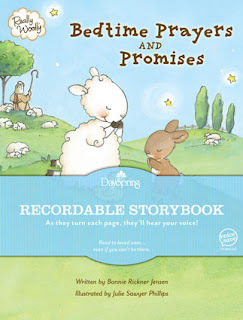 I thought about different resources that I could give her, and then I found the perfect one: a DaySpring’s Recordable Storybook: Bedtime Prayers and Promises. If you’ve seen some of the recent Hallmark commercials you know what I’m talking about. Recordable Storybooks are ones that you record your voice (or someone else’s) and your child can hear the story read by someone they love whenever they flip through the pages. When I first got the idea, I just assumed that I’d record my voice, or John and I would record our voices together. Then I got to thinking … this would be a perfect gift to include another person who loves Alyssa that lives far away, and I knew the perfect person. You see, Alyssa joined our family through adoption a year ago. 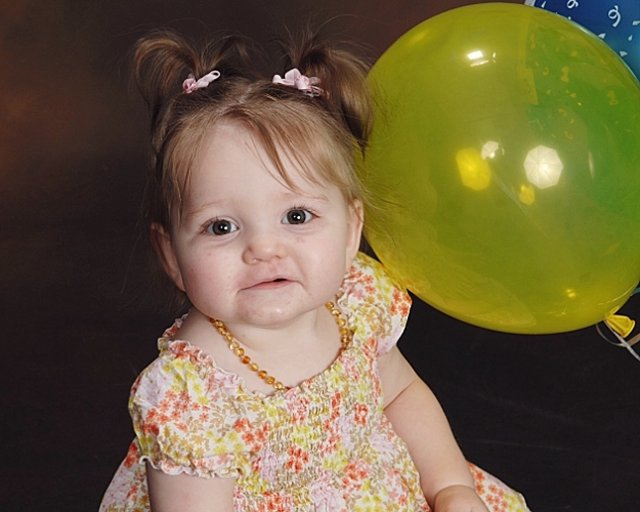 Alyssa has been a joy and a gift to our family. We’ve also enjoyed a relationship with her birth mom. We share our lives through photos and by sending weekly updates, but how much more special it would be if Alyssa’s birth mom could record her voice in a beautiful storybook! I love this idea because it reminds Alyssa’s birth mom that we appreciate her and the gift of life she gave us. It will also help Alyssa to be familiar with her birth mom’s voice so in the future when they talk over the phone or see each other Alyssa will understand she’s talking to someone who cares and not a stranger. How about you? Do you have a special child in your life who’d you like to share Bedtime Prayers and Promises with? If so, I’m going to give you a chance to be blessed! Who you’d like to give a copy of Bedtime Prayers and Promises too. Who you’d ask to record this book for your child and why. Don’t forget to leave your email address so I can contact you if you win! I will draw TWO winners next Tuesday, April 12th. I’m drawing it early so that if you don’t win you have plenty of time to purchase your own copy! They are being sold exclusively through Christian retailers. But wait …. I’m also going to be giving away a THIRD copy of Bedtime Prayers and Promises to a random tweeter. Post the following, and I will draw a winner from all who tweeted. Have you seen recordable storybook Bedtime Prayers & Promises available at Christian retailers? Like @triciagoyer I can’t wait to share it with my child! May you and a special child be blessed this Easter! I have no children of my own, but always have had children in my life. I currently take care of a Peruvian/Italian little girl who has stolen my heart and I would love to give her the book. I haven’t seen this book here yet. My husband and I would love to win this recordable Easter card for our Grandson Sawyer. We love being Grandparents…but our Grandchildren live so far away. My Son-in-Law, Daughter and their two Children are military. Right now they are stationed at Fairchild Air Force Base in Spokane, Washington. We don’t see them often enough! Thank you for this opportunity to win! Where were these products when my children were growing up? I’d love to give this book to my precious grandson Jake. He is five and a “surprise” baby. He is the youngest of many siblings who are teenagers and often feels left out. He becomes annoying and acts out when he tries to join them which causes a lot of ruckus around the house. Because he came along when Jennifer was an older mother, they both had major physical problems. I’m lucky to have both of them. I spent six weeks at their home helping the family and I’m so proud that they made it. It was a very rough time in our lives. Jake is a frustrated little boy. He loves books and be read to. It’s about the only thing that he settles down with. My mother always made it a point to bring out our new spring clothes the Sunday BEFORE Easter (or after depending where it fell in the season change) because she didn’t want us to get the idea that was what Easter was about. I don’t remember resenting that as a child, but as an adult, I think new clothes can be part of the celebration of the Resurrection. I love your idea of books that last longer than eggs or candy. I would love to win this one for my grandchildren. I’d love to give this book to my precious nephew Spencer. This is His 1st Easter. As an adopted person, it warms my heart to hear your idea of sharing this book with your daughter’s first mother and sharing her love with your daughter. I am reunited with my first family and am so thankful for the love I have in my entire family, both by birth and adoption. The reunion journey is not for the faint-hearted, but well worth it. I love the movie “The Prince of Egypt”…about the reunion of Moses with his first family and the emotional journey he took. My son was born 3 months early and weighed one pound. I’d share this book with him and maybe have his whole family each read a page…to symbolize the wholeness it has taken many years to find (through God’s healing and guidance in my own reunion journey). My husband and I would each read a page, my Mom (adopted) would read a page, and also a page read by my first family would bring it all together. I’m glad to have found your blog! Easter meant new matching dresses for my three sister and me-we have many pictures of us in our matching dresses with our hair tightly curled before we went to church and then to our grandparents for lunch and hunting eggs.I still sometimes will get a shirt to match one of my sisters-it brings back a warm fuzzy feeling. I would love to give this book to my new great-nephew who was born yesterday with hypoplastic left ventricle syndrome. It would be a great book for both him and his first time parents. I’m from Indonesia, one of country in the South East Asian. I don’t have any children yet, but I have a 7th month first niece this Easter. Maybe Indonesia just too far from your country (and maybe strange, :p), so, maybe I can realize your idea in other way for my niece, to introduce her to God. Every Easter my Dad would buy me a corsage to wear on my coat when I went to Church…he is home with God now for the past three years but I always think of him in a special way on Easter morning. I love books and have memories of my mother taking me to the library at an early age and letting me pick out a bag of books to bring home – since as a child we couldn’t afford books of our own. I give books as gifts to friends and family and at every baby shower I attend. I love to buy books for my two grandchildren. I would love to win this book so we could record it and send it to our precious granddaughter, Grace, who lives across the country and is now six months old. I would like her to hear Nana and Papa’s voices telling her about God’s love as she goes to bed every night. What a wonderful idea! Thank you. I am looking forward to someday being a grandparent. Our daughter, Bonnie, is getting married this summer…so maybe soon? (Currently have 2 “grand-dogs). I was diagnosed with a primary brain tumor 2 years ago and one thing is certain about my future…it is secure in Christ. I know that because of the Easter story of his Death and Resurrection.One thing is also certain about our time here on Earth…it is uncertain. I would like to leave a legacy of Christ’s love and promise for those who follow Him. Maybe someday I will be reading this book to a grandchild in person. If not, I would love to give this gift to a future grandchild. Christ’s love is meant to be shared. Parents, grandparents, family and friends who share the story with children spread the message and plant a seed of faith. Thanks for offering up a special way for us to tell the best story ever! My girls would love this book and I would love to have my husband make it! Our little girls love there daddy. It would also be a great gift for a non believing family friends kids. I would like to give this beautiful gift to my two amazing Grandsons Omar III (4)and Joel (3). They are my first grandchildren born to Marine Sergeant Omar Jr.(son) and Corporal Tiffany(daughter-in-law). I consider it an honor to be able to tell my grandchildren about the love of Christ, as my grandmother did for me when I was a child, which greatly influenced my personal decision to serve Christ as an adult. What a blessing! WOW you have your work cut out for you to chose just 3. If I won I think I would keep the copy I won for my granddaughters who are 2 and 4. I would record it in my voice. My memories of Easter is the family always getting dress for Easter and looking for real eggs that were hiding around our home. Being the oldest of seven that meant Mine were the hardest and usually the last found. Thanks for the Idea. Think I will go buy one for a solider and let him record it for his daughters first Easter that he won’t be there for! I guess the special Easter present I received as a child was my Easter Hat, everyone wore them then. and the song “Put on your Easter Bonnet….” would play…and then we’d drive to church. My favorite book, was a book that was part of our encyclopedia’s and it had all the childhood stories in it, I would marvel at the pictures before I could read the words. If I would your wonderful giveaway, I would give it to my granddaughters, Destiny and Skylar and their papa and I would record it, so they’d always be able to open the book and hear our voices telling them about promises…and on down the line they could read it to their children…love it…. Oh! How cute! I’d love to include this on my children’s Easter basket. We fill with Bibles, pens, candy, a book or a plush toy. This would be perfect! My favorite books as a child were the Bobbsey Twins. When I had grandchildren I loved reading “Peter Rabbit” and the “Velveteen Rabbit” to them. I always loved Easter and more especially so when I became a Christian. I would love to have a copy of this book to record my voice for my two grand-daughters. I recorded a book for my precious granddaughter for Valentine’s Day. She absolutely loves it and even sleeps with it at night til my voice puts her to sleep. She even got on the phone once when my daughter called and was playing the book for me. She said sweetly, “Mimi, can you hear you?” It would be a joy to share your book with her as well! I would love to share this book with my Grandson Wyatt who has just been diagnosed with autism. He is such a sweet a giving child and I would love to share this book with him and his Big Sister MacKenzie who has always been his protector. These recordable books are a fabulous idea! What a great opportunity to be asked to help promote them. I think how I would have treasured something like this when I was a child. My favorite childhood book was a Disney Donald Duck book, then later Black Beauty. I would like to send one of these to our great-granddaughter, Khloe Golden, (yes, my very first namesake:)who lives very far away from us here in Texas — Pennsylvania. And I would do the recording. You made me cry 🙂 Such a sweet and marvelous gift for your daughter! I would send the book to my great niece, who is turning 2 in July. Her parents are unchurched and I am the only family member who can get away with sending her anything Christian in nature. What a neat idea! I still have the storybook bible that my great grandmother (we always called her “grandma-great”) gave me when I was a child. I look at the pictures and remember her smile and how she talked so lovingly about Jesus. How precious would it be if I had a recording of that voice today. These books are going to be treasures! As a chronically ill mom, reading is one thing I can do, and can do well, with my kids. I don’t know how long God has me in this world and I would love my kids to be able to hold onto the memory of my voice and our special bedtime snuggles for many years to come. Thanks for posting this. I think my favorite book as a child was “Are you my Mother?” by PD Eastman. Still speaks to me today. Congrats to Leona and Anne Payne – you both won! Please email my assistant Amy (amy@triciagoyer.com) with your mailing address.